Edgar Allan Poe was a person that had a hard life to say the least. He lost both of his parents and he became an orphan by the age of three. That alone would fairly tragic for a person, but his woes didn’t end there. His foster mother also died, as well as his wife Virginia-a death he never fully came to peace with. He never received much love from his foster father and when he went back to live with some family his brother died as well, which is the turning point in which he became serious about his writing. Poe is known for his dark and depressing stories and poems and after seeing a brief history of his life it is easy to understand how it influenced his writings. His Mother, foster mother, and wife were arguably the only three people he ever truly loved and they all died. We see this theme of young women dying in a lot of Poe’s stories and poems such as; “Annabel Lee,” The Fall of the House of Usher,” “The Oval Portrait,” as well as “The Murders In The Rue Morgue”. His alcoholism is even portrayed in “The Cask Of Amontillado”. 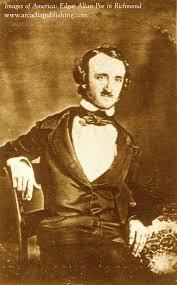 Poe was also known for his literary critiques and his often disagreements with the Transcendentalists, often referring to them as the “Frogpondians”. His most well-known quarrels were with Longfellow and Emmerson. He often accused authors of plagiarism, most notably again with Emmerson, which was somewhat confirmed later by his biographer. While Poe may have not had a grand life he is looked at as one of the greatest literary influences in American Literature. He is often credited with being the first detective writer and as the master of the short story.